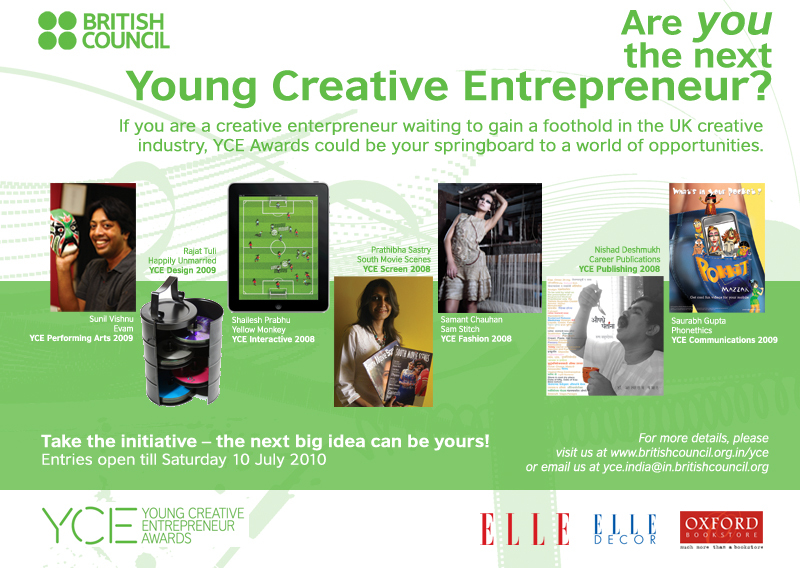 The British Council’s Young Creative Entrepreneur (YCE) Awards programme which aims to develop a powerful professional network between creative entrepreneurs in India and the UK to inspire and facilitate the sharing of best practices in building skills and access to resources, professional development, markets, mentoring and resources thereby increasing opportunities for business between India and the UK. The awards include recognition schemes for entrepreneurship in Publishing, Design, Fashion, Interactive, Screen, Performing Arts and Communication. The awards aim to reward creative entrepreneurs based in India for their contribution to their respective sectors. The YCE award programme goes beyond simply recognising the achievements of these entrepreneurs by providing them a platform to begin a dialogue with their UK counterparts. WOW! Cant wait to be in touch with creative entrepreneurs like me, thru this blog. I am a Graphic Designer (Print Media) and love doing what i do best… design! Hi, Jyothi – I’m a communication for development specialist (and a filmmaker by training) who runs his own not-for-profit called Ideosync Media Combine, based out of Faridabad, NCR of Delhi. We do lots of design stuff to support our media work too! This award will really encourage young entrepreneurs. Anyone knows when this will be organized for the year 2012. Hi, I run an agency in Mumbai that works only on unconventional solutions for brands and would love to connect with other creative entrepreneurs who are pushing the envelope. Is this award still alive and kicking? Why not turn it into a forum BC? I really enjoy reading through your articles.